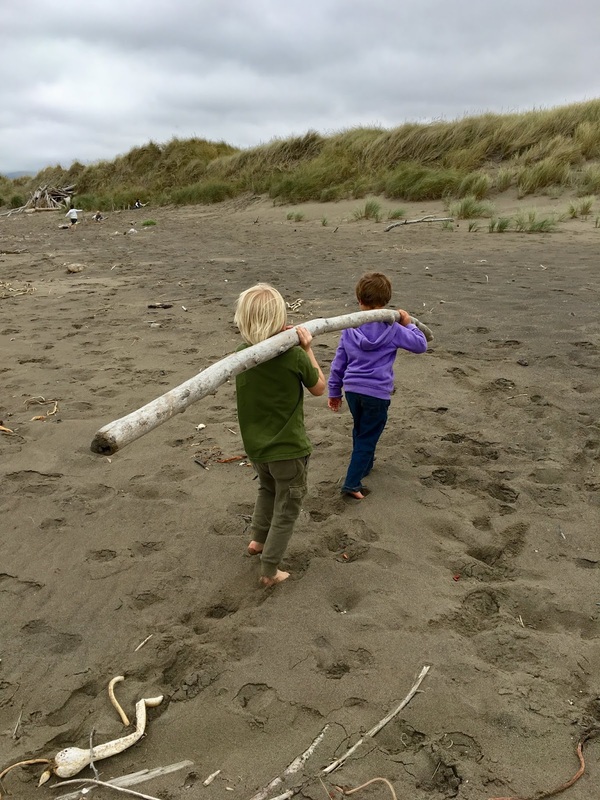 Today the kinders celebrated California Coastal Cleanup day (officially on 9/15) by picking up trash in the dunes and along the beach. We began the day with a discussion about why it's important to keep our beaches clean. The children came up with a lot of good reasons why trash shouldn't be at the beach! For example, to keep the animals safe, to keep the people safe, and to keep the land looking beautiful. When we arrived at the dunes, the boys decided to put on gloves and join me in the trash pick-up while the girls stayed behind and played in one of the driftwood shelters. While playing, the girls found a sand flea! They were very excited about this! Meanwhile, as the boys and I picked up garbage we also found cool treasures along the way. They found shells, seaweed, more pieces of an old pirate ship, and ANOTHER driftwood house! Naturally we had to stop and play in it before continuing on our journey. We followed up this activity the next day by reading the book "Surf Gecko to the Rescue," a charming story about a surfing gecko who uses his skills on the waves to raise awareness about pollution. As a bonus, the story ends with a reminder about keeping your home environment clean too. In our case, this meant the school grounds. We then embarked on a second wave of Coastal Clean Up celebration by picking up litter all around the PCCS campus. All together the students picked up 6 pounds of trash! Way to go kinders!